Education HNC (Higher National Certificate) in Electrical Engineering at Manchester College of Science and Technology. In 1970 John accepted an offer to work in Johannesburg, South Africa on a two year contract to ESCOM (Electricity Supply Commission). At the end of the two year contract John, his wife and family took permanent residence and remained in Johannesburg until his retirement in 1991. In 1993 he and his wife relocated to Fish Hoek in Cape Town. In 2005 his wife suggested he enrolled for an eight week sculpture course at the Bronze Age Foundry (using the lost wax technique) in Simons Town. This proved to be a catalyst which resurrected his dormant interest in art he started creating bronze sculpture involving him in the waxing, gating and fettling of the product. 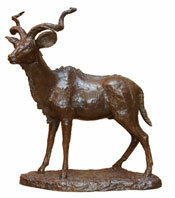 Most of sculpture to date have been inspired by his love of the abundant African wild life. Being less than 30cm tall make them convenient for overseas transportation. His sculptures are to be found in Private Collections in the USA, China, Europe, Sri Lanka.